I love texture in glass and I love the colours and effects available with coloured glass frit. There can never be enough shades of pink and purple and I try to give subtle changes of colour within this piece. There is a light sprinkling of small purple bubbles trapped between the layers of glass which add more subtle interest and texture. 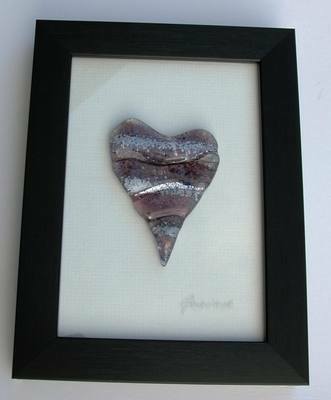 This "purple wave design" has been applied to many different pieces of my work and in this piece I have mounted the purple textured heart on a larger piece of glass and then put it into a box frame. The framed picture is 16cm wide by 21.5cm tall, measured to the outside edge of the frame. The box frame is 3cm deep and is available in silvery-gold or black. (NB This item is listed for the dark frame, so please select the applicable item for the silvery-gold frame). There is a fixture on the back of the frame so that you can hang the picture onto a hook on the wall. The piece is finished with my etched signature and whilst I make similar pieces, the nature of the hand-made production method means that no pieces can ever be identical.